Bitte nicht erschrecken, liebe Weltsicht-LeserInnen, ich bin’s immer noch, der S.H., aber heute muss ich einfach mal den geek aus dem Käfig lassen. 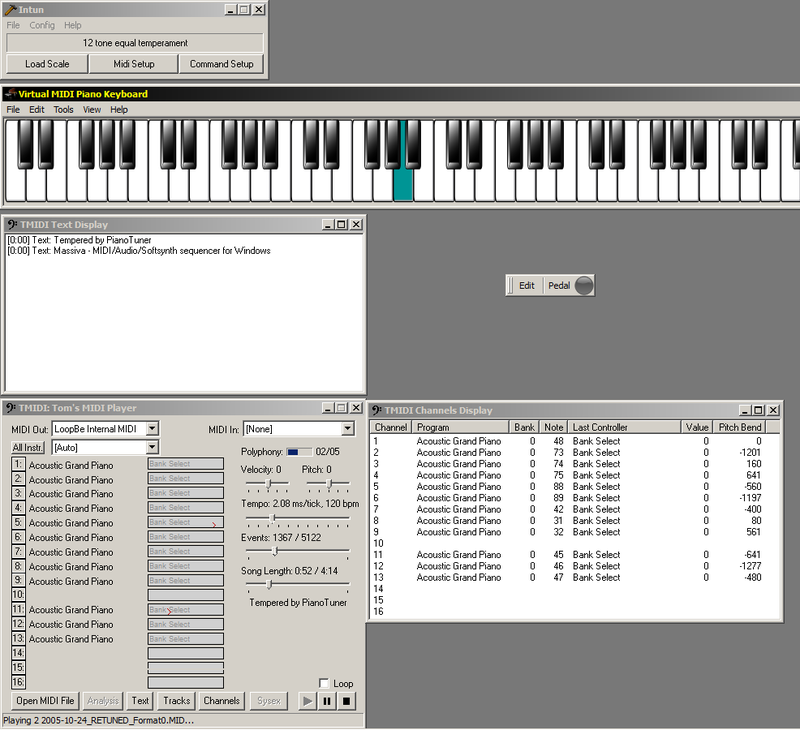 Download and install (=d&i) VirtualMIDISynth (VMS). D&i the Yamaha Disklavier soundfont. D&i Markus Schwenk’s excellent MidiEditor and select VMS as MIDI OUT. D&i intun and select LoopBe1 as MIDI IN and VMS as MIDI OUT. Make your mind up for a specific temperament. A huge scale archive is available here. You have to manually adapt this archive’s scl files before you can use them with intun. Open them with Notepad and use intun’s example txt files as templates. D&i Tim’s MIDI Player (TMP) and select LoopBe1 as MIDI OUT. „Rehearse“ your input data with TMP triggering intun triggering VMS. You are now able to listen to the music in different temperaments in realtime, while the actual SMF remains unchanged. For me, this is the most important part of working with microtonality: I have to hear what a scale „does“ to my composition in realtime to decide if it is usable or not. From a mathematical point of view, countless microtonal scales are possible. But, for me, it as a purely aesthetic decision which scale to implement. D&i PianoTuner and process your SMF with it. The chosen temperament (e.g. this one) is now hard-coded within the SMF. If everything sounds ok, d&i the TiMidity++ Windows Synthesizer (TWS), selecting the Yamaha Disklavier as your output soundfont by creating a textfile timidity.cfg in the TWS directory and writing soundfont /[path to your soundfont]/[name of your soundfont file].sf2 in it. Select RIFF WAVE file as TWS output. This howto is also available as a static webpage on my homepage here. If technical issues change, it will eventually be updated.